Last day playing catch up on #Blogtober14! Yesterday's prompt was about your best or worst Halloween memory. Like I said in the best or worst vacation memory post... I don't have many negative memories from my childhood! I'm very blessed to have many vacations and holidays that were just so fun! Maybe that's naive and boring but it's the truth. I have plentyyy of embarrassing stories from my childhood (and from last year, and last week, and yesterday..) that might be funny or entertaining to read but they usually didn't occur on holidays (maybe why I'm so totally obsessed with holidays now). Some of my favorite themed chalkboard prints from Jessica , one of my favorite bloggers ever! I linked her Etsy shop and I encourage you to check it out as well as her blog if you haven't already. My birthday is on November 1st, so Halloween was always such a fun day for me because it was like having a pre birthday party every year complete with dressing up (one of my favorite things growing up) and candy (still one of my favorite things). 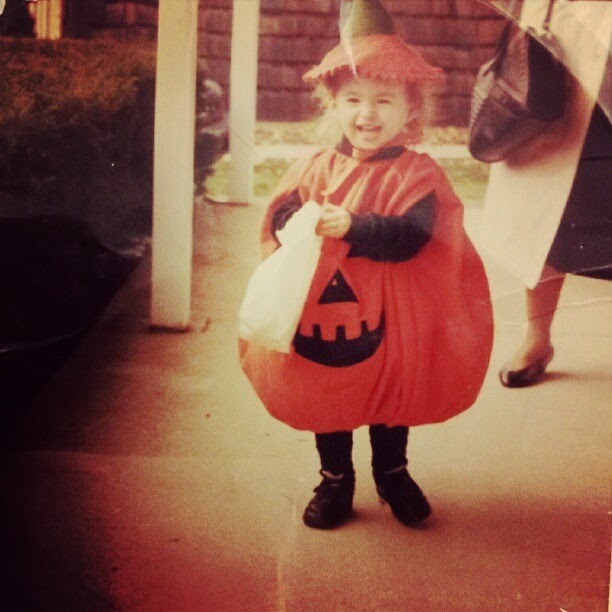 Halloween has always been a giddy, nostalgic way for me to have fun. I leave you with a picture of me when I was maybe two years old. I'd kill to be this psyched always.